﻿Overall type designs are making a big comeback. They are being made in as many fabrics as you can think of, from denim to silk, dressy to causal, anything goes. 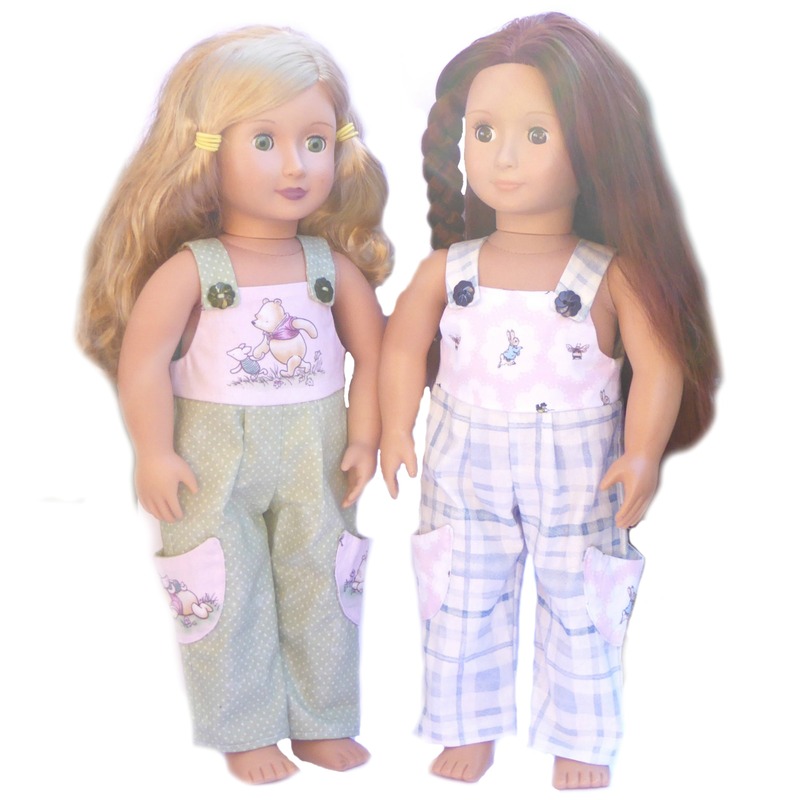 This cute overalls style jumpsuit for 18 inch dolls can be made to wear with or without a top underneath. Trim options are limitless. They can easily be dressed up by adding embellishments or rhinestones. Add lace or whatever your heart desires to make them special and your own. Instructions are included in this PDF doll clothes sewing pattern for covered cord and zipper insertion. Your doll will love the look of the big open pockets and the comfort of these overalls. She will look great for shopping, play, or whatever she has in store for the day! -1/3 yard for making from one color fabric. -1/8 yard or scraps for lining top. -1/8 yard or scrap for coordinating top and pocket. (if covering cord, be sure to use the tiny baby cable cord ). -hook and loop tape or a 7 inch zipper for back closure. This is a very cute outfit. I did have some difficulty with getting the seams to line up when attaching the bodice to the bottom. I made an adjustment to the pleats by making them a little narrower. The jumpsuit fits the Our Generation Doll quite well. I also had problems with the strap length and the top back piece does say cut one of fabric and one of lining. You do need to cut 2 or you only have one side of the back. I made the overalls in navy baby corduroy and they are adorable. I will try again but will add length to the straps. perfect pattern, thank you ! I am so thrilled at how this pattern turned out! I made two and love both! Thank you for the pattern, I found it easy to follow and I didn't have any trouble with the strap length as I printed at 100% scale. I love all the patterns I have purchased. This one I am excited to make.